Bill Wyman (born William George Perks Jr., 24 October 1936) is an English musician, record producer, songwriter and singer. He was the bass guitarist for the English rock and roll band the Rolling Stones from 1962 until 1993. 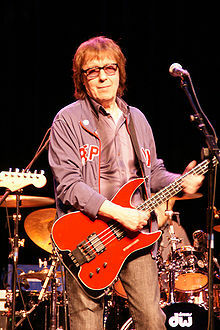 Since 1997, he has recorded and toured with his own band, Bill Wyman's Rhythm Kings. Wyman has kept a journal since he was a child after World War II. As an author, he has written seven books. Wyman is also a photographer, and his works have been displayed in galleries around the world. In 1961 Wyman heavily modified an inexpensive, second hand Dallas Tuxedo bass to create his own fretless bass guitar. As a businessman he owns several establishments, including the Sticky Fingers CafÃ©, a rock and roll-themed bistro serving American cuisine, which first opened in 1989 in Kensington.